In former times it was the custom along the coast of Tosa (Shikoku) on the day of jooshi 上巳 (the third day of the third month of the Asian lunar calender, the Hinamatsuri Doll Festival day) to go out to the flatlands and collect stones suitable to make inkstones. Inkstones from Tosa are famous to our day. On the day before Tanabata, the Star festival on the seventh day of the seventh month (of the Asian lunar calendar) it was a custom to wash your inkstone and clean the tabel before writing your wish to hang on the Tanabata bamboo pole. 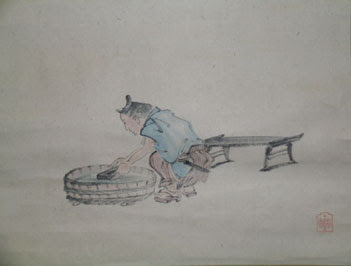 Nishiyama Hooen "Washing the ink stone for Tanabata"
Museum of Art, Ashia Town.
. Star Festival (Tanabata 七夕) . is literally a stone mortar for the grinding and containment of ink. Traditional Chinese ink was usually solidified into sticks for easier transport and preservation. Even a small amount of water could be applied to the end of a stick of ink, and that end would be ground with the flat surface of the ink stone. 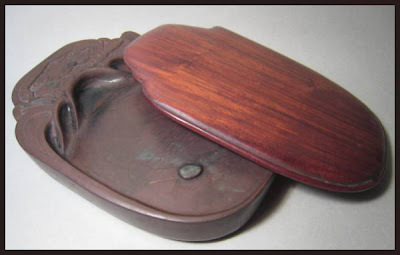 A larger quantity of ink could be ground from a small pool of water placed on the inkstone. Water could be stored in a water-holding cavity on the inkstone itself, as was the case for many Song Dynasty (960-1279) inkstones. The water-holding cavity or water reservoir in time became an ink reservoir for later inkstones. Water was usually kept in a ceramic container and sprinkled on the inkstone. Four Treasures of the Study. Large replica of a suzuri ink stone, Nanzen-ji temple. About 17 cm long and 12 cm wide. 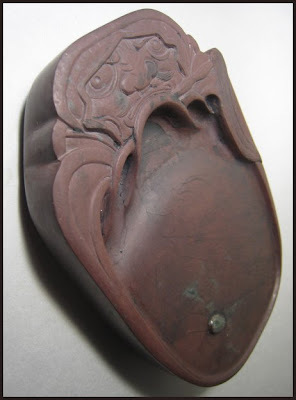 Until the Edo period, most ink stones had been imported from China. But now craftsmen begun to create their own work, as more townspeople people tended to write and were in need of cheap utensils. The stones came from Yamaguchi: akama ishi赤間石, Yamanashi：amabata ishi　雨畑石, Aichi:鳳来寺石　Horaiji ishi and Tohoku, especially Iwate. Cutting a natural stone was hard work. 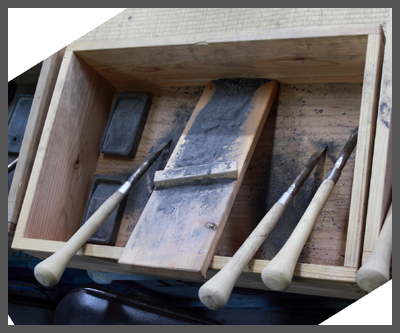 Smoothing the surface of an inkstone 硯切り was again hard work for dilligent craftsmen. suzuri no umi　硯の海 "the sea of the inkstone". This part had to be scrubbed with a special long chisel (ノミ）tool. CLICK for more tools of the trade ! 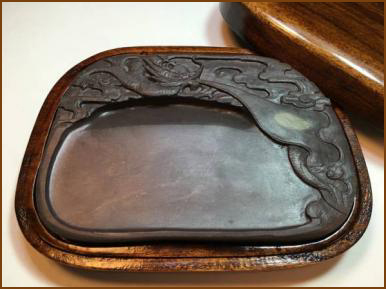 Shiunseki Suzuri or Shiunseki Inkstone is an inkstone produced in Ichinoseki City and Oofunado City of Iwate Prefecture and is made from stone called Shiunseki that has a distinctive texture. The origin of the inkstone dates back to Kamakura period when a monk who, on his travels, dropped by Chouan-ji Temple in Oofunado City and found a shiunseki stone at the bottom of a nearby river and used the stone as an inkstone. The monk later took the stone back to Kamakura and dedicated it to a Shogun at that time. 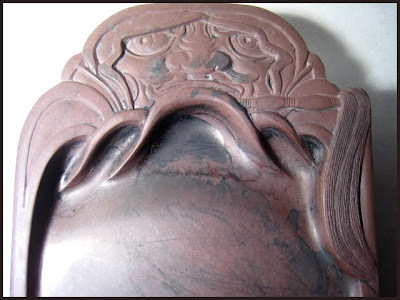 With its beautiful looks, the inkstone was named Shiunseki (purple cloud) Inkstone. Shiunseki stone is a schalstein extracted from soil more than 400 million years old from Kitakami mountain. The stone has a red-purplish color similar to azuki red beans. Also many of them have characteristic cloud-shaped patterns or greenish spots. In addition to elegance and smoothness, the surface of the stone has fine and minute imperfections that allow ink-cake to be ground finely. 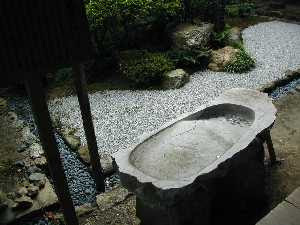 These characteristics make Shiunseki stone the most suitable stone for inkstone. 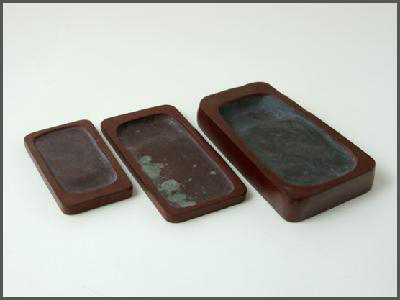 There was a time when mass production of machine made inkstone was widespread and handmade Shiunseki Inkstone making waned. However, after World War II, artisans began turning their attention back to the craft of hand making the stone. Shiunseki Inkstone is still now being produced with the same quality as its legend suggests.
. Ink stones from Ogatsu town, Ishinomaki 石巻 雄勝町 . David Coomler discusses Reichhold's translation of this haiku to point out what he sees as shortcomings in her translations of Basho's haiku. 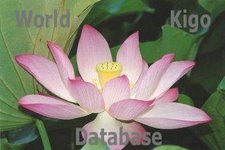 translations of Basho from his website. her translation: "inkstone." This seems such a striking choice by Ms.
"Is this the inkstone I have picked up?" or "thus" one spoke or acted. Could one make a case for Ms. Reichhold using the "said" or "spoke"
Although most English books about haiku flat-out define 'ka' as "a verbal question mark" (to quote Henderson), I have found a Japanese critic who implies that it is not so clear-cut. that it has grown so scrawny? As illustrated by these examples, it is not easy to tell right away whether the final particle 'ka', so favored by Basho, was used as an interrogative or emotive particle, and this indeterminacy adds tension to the poems. I would ask Ms. Reichhold if she was interpreting 'ka' as an "emotive particle" in her translation. I want to end by addressing one more of Mr. Coomler's points about Basho's 'inkstone' haiku. "It is not a very good verse and it requires knowing the background, but nonetheless it has meaning that Reichhold fails to transmit." I contend that, although it is not a great verse, it is better than Mr. Coomler's opinion of it. It contains what to me is a healthy nostalgia. Who among us doesn't treasure some keepsake of a loved one or, lacking a keepsake, wish we had one? 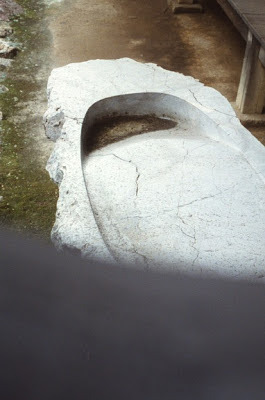 Basho attempts to imaginatively bond with his most significant cultural hero, Saigyo, by imagining that a hollowed-out stone with dew in the hollow might be the actual hollowed-out stone that Saigyo is said to have used for an inkstone when he was living for a while in seclusion at Futami, near Ise. I find this haiku to be a very moving expression of Basho's sentiment. 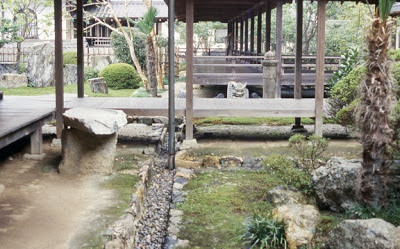 Seiryu-En . . . the place where long ago Kinoshita Choshoshi had his retreat. 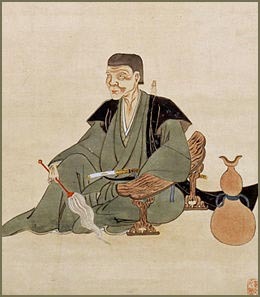 A Momoyama waka poet, Kinoshita Choshoshi was the nephew-in-law of Toyotomi Hideyoshi and had exchanges with Confucianist Hayashi Razan, devotees of the way of tea, tea master and garden architect Kobori Enshu, as well as with many nobles of the court. He studied waka poetry with Hosokawa Yusai, an initiate of the traditions of the Kokinshu collection of 'ancient and modern' poems. From the early modern age to more recent times this has been the stage for such activities as the creation of paintings and literary works, or tea gatherings, and many writers and artists have gathered here. Basho had visited Kyorai to see the procession of the monks. They do it for 48 days, starting on the 13th day of the 11th lunar month. First yearly Memorial Service for Kuuya Shoonin . This hokku is from the end of the first lunar month (February) in 1813, a few days after Issa had reached a settlement with his half brother that divided up their father's inheritance, including the family house, equally between them. The headnote refers to the famous warrior waka poet Kinoshita Chōshōshi (1569-1649), who wrote about an imaginary court waka contest between fifteen pairs of different insects, with the fifteen winners being chosen by a judge who was a large frog. The contest was published as a book, Insect Waka Contest, sometime between 1624 and 1644, and Issa must have read a copy. In the headnote he praises a frog he sees sitting calmly and gazing at a mountain in the distance. In this humorous headnote Issa tells the unmoving frog with its imposing eyes and lofty gaze how much he respects him for being a descendant of a fictional frog chosen by Chōshōshi for its ability to understand waka, thus implying that the croaking songs of this actual frog, too, are outstanding frog waka. The gaze of the frog also has spiritual implications, as can be seen from a further allusion, this one to a poem by the Chinese poet Tao Qian (365–427), also known as Tao Yuanming. Tao Qian was a minor official who gave up his boring work and became a farmer in a country town. Strongly influenced by Daoism, he spent most of his time writing poems and drinking with his friends, and his poems give off a strong feeling of a free spirit carrying on a dialog with both nature and other free spirits. Issa alludes to the fifth poem in a series of poems entitled "Twenty Poems After Drinking Wine," a poem most of his readers would have been familiar with, since it was very famous in both China and Japan. and yet I hear no noise of horses or of carts. You ask, how could this be? My mind detached, I live in far-off places. my calm gaze reaches a distant mountain to the south. and birds fly back together to their nests. Within all this are signs of the truth. When I try to explain, I've already forgotten words. One reason the poem is so famous is that it is able to show what it is doing even though it can't explain itself. In the fourth line the detached mind of the poet allows him to live in remote seclusion even though he lives surrounded by people in a town, and in line six "distant" returns to "detached" in line four and suggests that the detached spiritual gaze of the poet allows his mind to visit the distant mountain, causing the reader in Chinese to feel a double image in which the poet gazes at the mountain in an unattached way that allows him to travel to it. The grammar allows this double-vision to be performed by readers before they can rationally delete the second image from their minds, since normally, of course, seeing is not traveling. The next two lines further suggest that far is also near, that Tao Qian has gone to the mountains and is breathing the mountain air and viewing the sunset and birds at fairly close range. Thus Tao Qian becomes fused with the mountain, as if he were returning back to his spiritual home or "nest" there. Tao Qien leaves a further hint by having this vision occur while he is picking chrysanthemums. That is, he is only able to have visions when he isn't trying to see them, or, as the last line says, when he has forgotten words. He seems to be urging readers to leave logic and ordinary meanings behind when they read his poems. Issa was a careful reader of classical Chinese and Japanese literature, so Tao Qian's paradoxical approach was surely intuitively apparent to him. By quoting part of Tao Qian's Chinese poem, Issa, as so often, is able to bring together opposite images or registers, here mixing vision with earthy humor, sublimity with irony. On the one hand, he praises the poetic sensibility of the frog using grandiloquent rhetoric that suggests the frog's posture is in one sense pompous and vain, while on the other hand he compare's the frog's big-eyed vision with Tao Qian's, implying that the frog has become one with the mountain it watches so intensely and that its unmoving posture suggests it is the unmoving mountain, or at least a smaller frog-mountain version of the mountain. This contradiction seems to be the point of Issa's hokku, as it is with so many of his hokku, many of which are self-ironic. The image of the frog here and the image of the returning birds in Tao Qian's poem would certainly fit with Issa's own mood after finally receiving his half of his father's house and realizing that he would soon be able to return to his hometown to live. 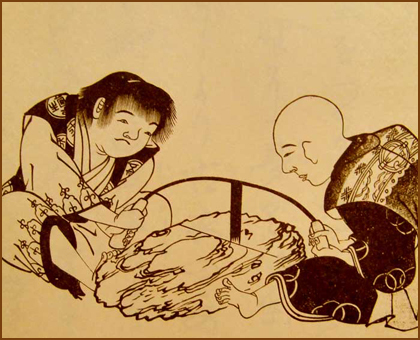 The image of Issa talking with a frog and staring at one of the high mountains near his hometown and feeling at one with it may lie behind this hokku, as well as the image of Issa acknowledging that while his humble hokku are not as elegant as classical waka they nevertheless are capable of dealing with important aspects of everyday life that are both ridiculous and inspiring at the same time. The above version of the hokku is found in Issa's Seventh Diary from 1813, but he uses the hokku again in Year of My Life, as if it had been written in 1819, the year evoked in Year of My Life. The hokku must have meant a lot to him, and he wanted use it again in Year of My Life after a passage about a funeral for a frog. Issa uses the same headnote about a frog judging waka in both 1813 and 1819. In Year of My Life, however, he also mentions that frogs were believed to have various spiritual and magical powers in ancient times and that he enjoys sitting together with them in the cool evening air. This is the first death anniversary of his disciple Okamura 岡村不卜Fuboku in Edo. Basho was very close to Fuboku and has also written a hokku for the death anniversary of his mother.
. WKD : for the Mother of his disciple Fuboku . 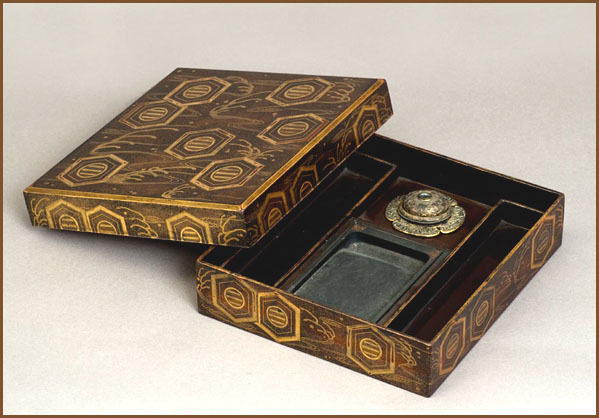 An inkstone box was a very treasured utensil, especially for a haikai master travelling a lot. Fuboku was a friend of Basho and Kinpu. The calling of the cuckoo bird was supposed to make a person miss the past. The cuckoo is a metaphor for Fuboku. There is also the idea that the voice of the bird is in the old box and the words no longer written by the man remain in the inkstone." Student of Ishida Mitoku 石田未得 of the Teimon school. of this ink stone . .
. kiku no tsuyu 菊の露 dew on chrysanthemums .
. Mizuhara Shuoshi 水原秋桜子 .
. Ogawa Haritsu 小川破笠 and his inkstone boxes . A few days later the blue sky turned dark and a long strong rain started. The raindrops were all black, they say.